Ever since we started this studio rental, we have gathered a lot of feedback from our beloved clients in order for us to improve. When we said our studio is more than a studio, we really mean for it. Our studio also suitable for dance practice (we have huge mirror) or you can even conduct classes. 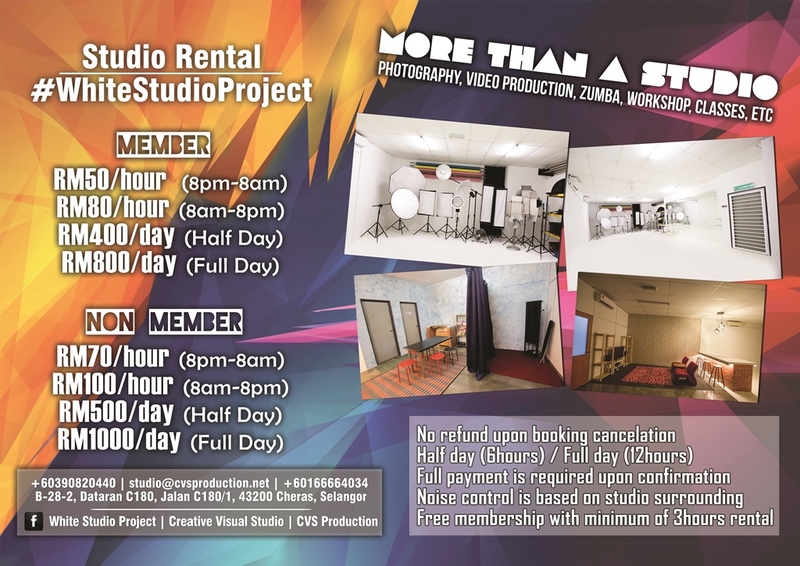 If you are looking for a studio rental or a photographer with a studio, do contact me at +60166664034 (Whatsaap / SMS). Our studio is fully equipped for photography and video production. Do not worry about the safety because we do not only cover with grilled door and CCTV but also we have a security guard on duty 24/7. We also believe that it’s important for our customer to get refreshed and for our Muslim clients to perform prayer. Not to mention a comfortable place for them to change their cloth. We do provide drinks and snacks. Living room & bar also important for us because we believe that it’s important to balance between work and leisure in order to provide high quality not only the final product but also for the services.